Kalos has been revealed, yet so much still remains unseen! New Trainers, new tactics, and the awe-inspiring Xerneas and Yveltal await as does something else. Something's different. Something to make even the mightiest of Pokemon-EX tremble! 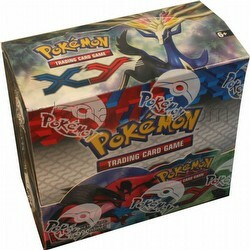 A new age begins in the Pokemon TCG with Mega Evolution! 2 all-new Mega Evolution Pokemon! 6 new Pokemon-EX! Over 140 cards in all!